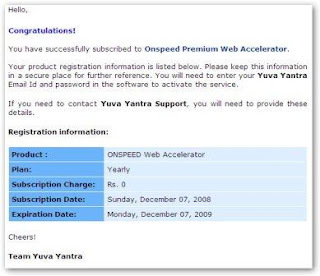 In one of my previous post i had talked about free license for Kaspersky Anti-Virus being offered by YuvaYantra and now they are offering 100% free genuine one year license for ONSPEED Web Accelerator, the popular web-acceleration software from ONSPEED offers upto 10x speed gain on Dial-up connection and upto 5x on Broadband connection achieved using proxy based compression. ONSPEED offers a unique, patented technology called â€œAdvanced Imagingâ€, enabling you to receive fully viewable and instantly usable web pages, while maintaining the maximum quality of images. Advanced Imaging delivers all images on a page simultaneously. You continue to browse web pages while images are being progressively loaded. Image quality progressively improves until images have reached lossless quality. However it got some limitations too. ONSPEED does not increase the size of your Internet connection. It compresses the data received hence speeding up your web browsing experience. ONSPEED does not replace your existing Internet Service Provider (ISP) and is to be used in conjunction with your existing Internet connection. ONSPEED will not accelerate browsing over HTTPS (secure websites), file downloads or uploads such as QuickTime files, MP3, AVI, MPEG, exes or streaming media content (over FTP or file sharing programs). ONSPEED will accelerate both compressed and uncompressed JPEG, PNG and GIF files. Now to get it free follow the steps below. 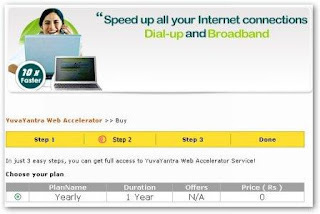 Click the free ONSPEED Web Accelerator banner. Login to your account or signup for one free (recommended for future offers). Follow the simple process by clicking Next.You will get ur free subscription.